NHL News : Terrible updates on Predators Wayne Simmonds and Brian Boyle. Terrible updates on Predators Wayne Simmonds and Brian Boyle. Very bad news for the Predators. The Nashville Predators have just been hit with some devastating news. 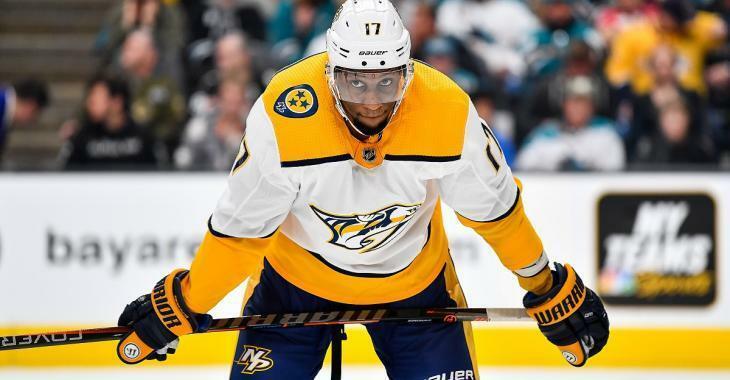 According to a breaking news report from Nashville Predators insider Adam Vingan of The Athletic the Predators have lost both veteran forward Wayne Simmonds and veteran forward Brian Boyle for what appears to be an extended length of time. There has been no official timeline provided for either player but according to Vingan both men are currently being viewed as "week to week." Week to week is of course something you never want to hear in the playoffs because even just a single week can determine whether or not you advance to the next round or hit the links on the golf course. It is bad enough when this happens to one player but to lose two players so early in the series is a massive blow to the Predators who have frankly been so unlucky with injuries in the playoffs in recent seasons. According to Vingan the injury to Simmonds is a lower body injury and although no more detail has been provided I think it's pretty safe to say his knee is in pretty rough shape. Everyone by now has seen the shot fired by teammate Roman Josi bounce of Simmonds' knee in sickening fashion and there's no doubt in my mind that is the source of his injury. As for Boyle he was only out with an illness which makes this news rather shocking, but once again Vingan is on top of all the details. It sounds like Boyle was forced to undergo a surgical procedure related to his appendix, which of course is absolutely garbage timing for the Predators. Predators cant seem to catch a break right now, and they will need some big wins if they want to last long enough to get either man back into their line up for the 2019 Stanley Cup Playoffs.